"In 2000 Henri Pousseur was asked by Philippe Samyn, an architect from Brussels who likes to work in association with other arts, to lend his support to the plan for the construction of a business complex by one of the most important building enterprises in the country. There were four low buildings arranged like different parts of a medieval castle-village, grouped around a kind of large open central court. Pousseur immediately suggested that the first spinal-column be composed of an electronic carillon, sounding in variations every hour, thus marking the hours between 6 a.m. and 10 p.m. Henri Poussuer imagined then a connection between the time of Nivelles (a city 40 km south of Brussels, where this large project will be situated) and the time of the entire planet and the more or less metaphoric sonic and musical realities attached to it. He made on the one hand the 16 hours of a theoretically complete day of work (from the cleaning service up to the last researches in the office) correspond to the 24 hours of a complete terrestrial revolution. And divided the globe into eight large north/south 'slices', themselves divided into three perpendicular 'rings': north, center, south, with the understanding that only inhabited lands were taken into consideration. To each of the 8 'great hours' of the total duration, Pousseur associated three regions, one of each ring (north/central/south) set out as far apart as possible on the terrestrial globe. Over a background of a fairly continuous variety of noises which are perpetually evolving: sea, fire, city, swamp, industry, forest, etc. there are ethno-musical samples from one region or from several regions involved, more or less worked over by all sorts of numerical methods which vary their capacity to be recognized and their effectiveness as quasi-traditional music. This work once finished (realised in the Studio of the composer's son Denis), Pousseur made a synthesis on three discs by superimposing the landscapes (a bit in the manner of the previous Etudes paraboliques) in 16 Paysages Planetaires. The titles of the landscapes expresses by their contraction the simultaneous or alternate presence of several regions; for example, 'Alaskamazonie' is self-explanatory. Something like 'Gamelan Celtibere' brings out a play; between the West Coast of Europe with the Indonesian archipelago and even the northern part of Australia. Continuing like this you could find it amusing to reconstruct the circum-planetary movement of the work. 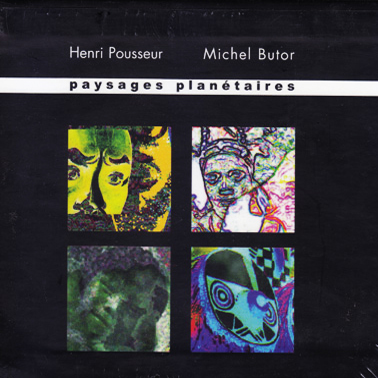 Michel Butor, for forty years accomplice of Henri Pousseur, has been willing to write the prose-verse alternating poetic structure, very luminous, which makes a global accompaniment to the procession of these landscapes. His text is included in the 60 pages documentation booklet, also featuring two long essays by Henri Pousseur: 'Paysages Planetaires' and 'Athmospheric and Cultural Sources for Each of the Landscapes'. Finally, by this work, Henri Pousseur renders homage to all the singers and instrumentalists, sound engineers, ethnic musicologists and editors who have either produced, or gathered and transmitted, all the marvellous musical invention which inspired and nourished the work and which, with the sounds of the world, of nature, of society and of industry, are supposed to represent a kind of formal summing-up of life's multiplicity on this sailing Earth as she travels through cosmic space. All the images, obtained through extensive digital treatments, were conceived and manipulated by Henri Poussuer." Heavy cardboard box set with 3CDs and 60 page booklet.